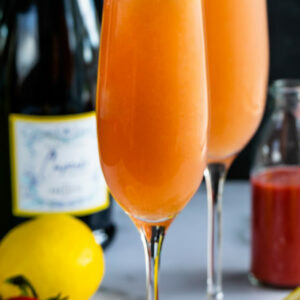 A Lemon Strawberry Mimosa has fresh strawberry puree and limoncello mixed with champagne! 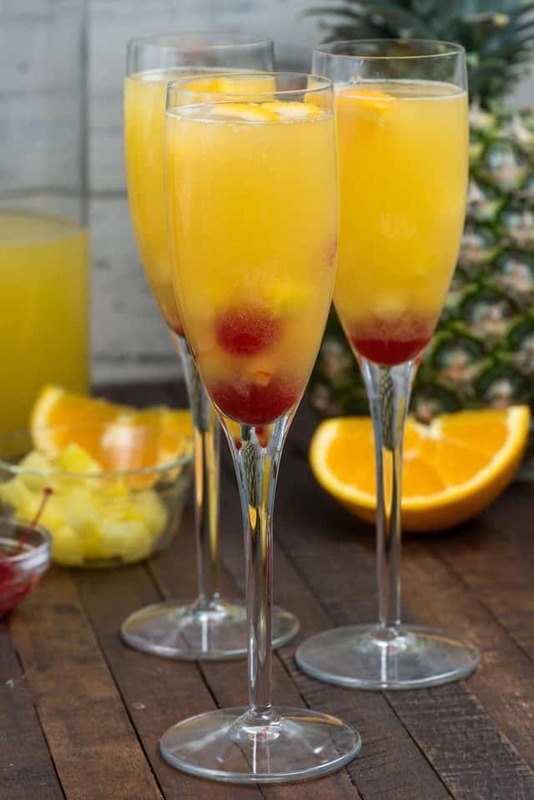 It’s the perfect Bellini or mimosa to start your day. The drink I always got when we’d go to the The Red Square was a peach bellini. Ya’ll know I don’t really like peach but in drinks, I love it. I loved those bellinis! Since I started blogging more cocktails, I’ve realized how much I love champagne drinks. I love martinis and punch, sure. But I really, really love the bubbles (mainly Prosecco, but I’ll never say no to champagne). As time went on I started to wonder what the difference was between a Bellini and a mimosa. From a blogging standpoint, Mimosa gets searched more so it makes sense to use that word. But what is the difference? I did some googling and honesty? I don’t think there is much of a difference, except that Bellinis are traditionally peach puree and mimosas are traditionally orange juice. This drink is neither, so I’m saying you can call it either name! I love how pretty these drinks are! Now that we’re getting close to spring and Mimosa Season (i.e. Easter and Mother’s Day), a strawberry mimosa sounded just right. As I was digging through my alcohol pantry (yes, I have a dedicated alcohol cabinet that holds all the partially empty bottles from the cocktails on this site; it’s got a lock on it to keep the teenagers out) I realized I had limoncello. Have you ever had limoncello? I love it and it pairs so perfectly with strawberry. Limoncello is an Italian-made lemon liqueur produced in Southern Italy. It’s made by soaking lemon rinds in grappa or vodka and it has that telltale lemon flavor, albeit super strong. It’s perfect to put in Lemon Martinis or a Lemon Drop Fizz, and it adds some lemon flavor to this mimosa. This easy mimosa recipe starts off with fresh strawberry puree. Yes, it adds a little bit of work, but it’s totally worth it for the beautiful result. How do you make strawberry puree for a mimosa? It’s simple; you just puree fresh strawberries with sugar and some fresh lemon juice. Once you have your puree it’s very important to strain it to get out the seeds and anything that didn’t pulverize in the blender. TIP: I like to strain my strawberry puree twice so that it’s super smooth. 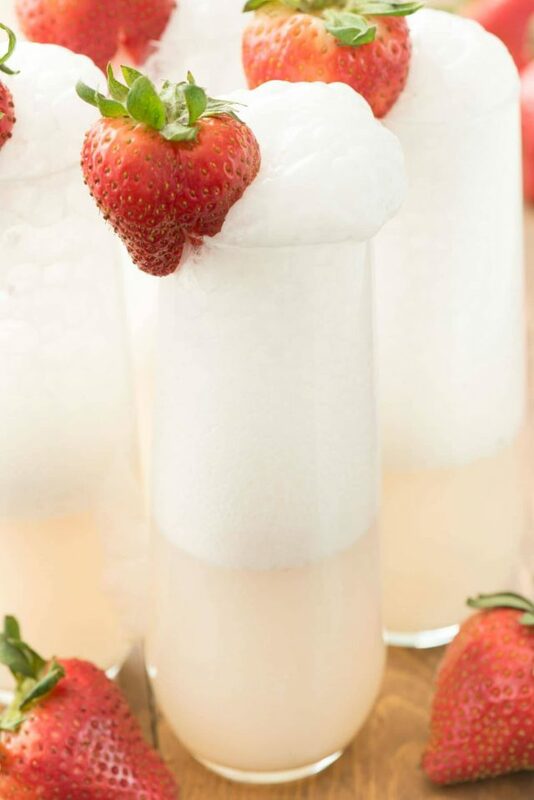 Once you have your strained strawberry puree, you’re ready to make a mimosa! I’ve learned as I’ve gotten older that cheaper is not better. Try to buy a mid-range (about $10-15 per bottle) brand. The cheaper ones are just full of sugar which is why you get a headache after drinking too many mimosas! I prefer a less sweet champagne or a Prosecco for mimosas. You don’t have to go super high end, but definitely don’t buy something too sweet; look for something labeled Brut or Extra Brut. TIP: Brut champagnes and sparkling wines usually have less than 2g of sugar per serving, whereas wines labeled dry can have up to 5g of sugar, so look for something on the Brut end of the spectrum. Since you’re mixing your bubbles with juice or puree, you don’t want too sweet of a champagne to start. Start with cold champagne and puree. This will keep your drink cold. Double strain your strawberry puree for best results. You can skip the limoncello if you want, but it adds nice flavor. You can use your own champagne to puree ratio if you like your mimosa stronger or weaker. Be sure to stir the puree into the limoncello so it’s not clumpy. 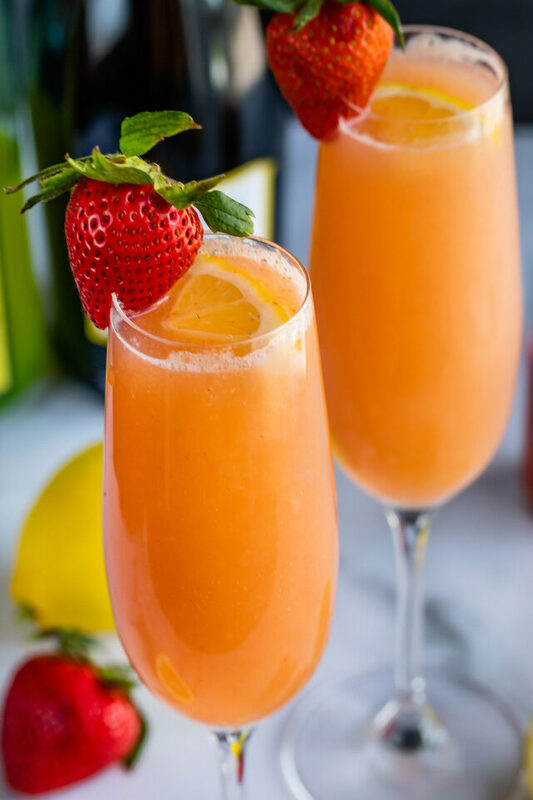 A Lemon Strawberry Mimosa has fresh strawberry puree and limoncello mixed with champagne! 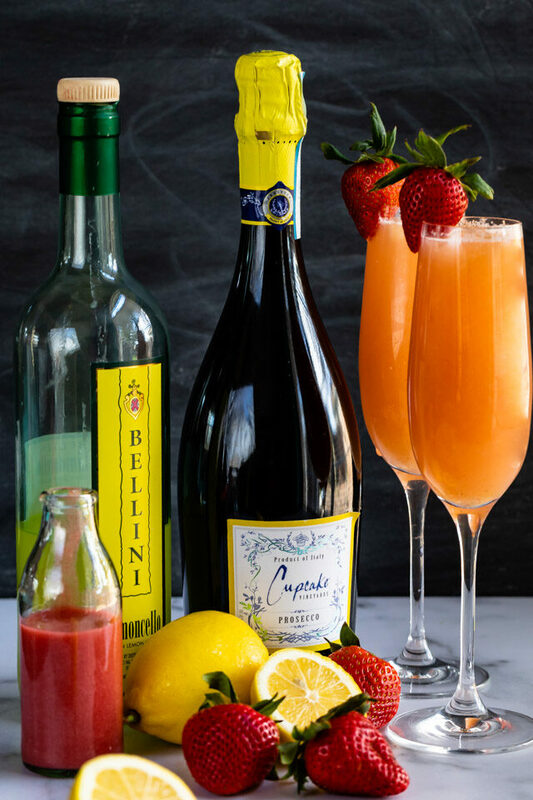 It's the perfect Bellini or mimosa to start your day. Make the strawberry puree: puree strawberries, sugar, and lemon juice in a blender until smooth. Strain it twice to remove any seeds or pulp. 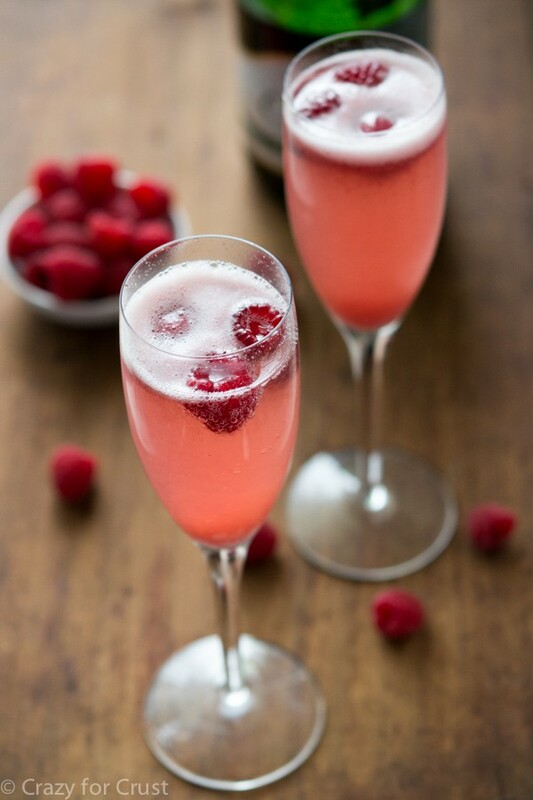 To make each mimosa: place strawberry puree in a champagne glass. Add limoncello and stir to combine. Fill the rest of the glass with champagne or sparkling wine. Stir gently if desired. Garnish with a half of a strawberry and/or some lemon rind. Click here to see more DRINK recipes! or for my complete list of Valentine’s Day Recipes!